Oregon scored big when 38th-ranked prospect in the ESPN-100 committed to the men’s basketball team yesterday afternoon. According to ESPN, Tyler Dorsey had the option of committing to California, Colorado, Connecticut, Arizona State and Kansas. Dorsey was formerly an Arizona Wildcats pledge but reopened his recruitment when Justin Simon committed to them and they started looking into other guards. 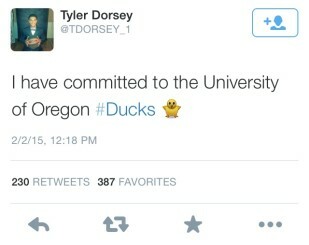 Now, Dorsey has chosen to be a Duck and announced it yesterday afternoon via Twitter. This 6-foot-4 athlete from Maranatha High School in Los Angeles, California is definitely going to be a big asset for the Ducks. Ducks star PG Joe Young will be gone, opening up a world of opportunities for other guards on the team. Casey Benson, the freshman from Tempe, Arizona has been doing very well in the guard position with and without Young on the court with him. However, positions are filled by hard-work and talent, not seniority; the point guard and MVP position are both going to be up in the air going into next season, it’s anybody’s game. Screenshot taken from Tyler Dorsey's twitter. Dorsey will take the court next season with two other top-100 recruits in point guard Kendall Small and forward Trevor Manuel. In an article on 247sports.com concerning Dorsey’s commitment, Jerry Meyer talks a little bit about the players game. He explains that this young man has an incredible shot but is also a great rebounder for a guard. Dorsey averages about 34 points per game and averages 11 rebounds and four assists each game. Meyer said he thinks Dorsey will be a good push up the court and I hope so, too. There’s nothing I love more than a basketball team hustling up and down the court! Especially on its possessions. Yesterday was only the first day of recruiting week and the Ducks scored big. I wonder what other talent they’ll claim throughout the week?